Hallelujah! Crossing my fingers for a quick fix. Help - I Can't Print Coupons! Except my coupon didn't actually print! For some shoppers printing coupons is as easy as point and click. 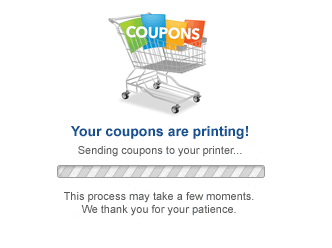 For the rest of us, (including me from time to time), it's a frustrating web of installing and uninstalling coupon printers, changing web browsers, reading printing error messages and receiving the standard formatted response email from coupons.com. Unfortunately, printable coupon sites don't always respond well to web browser security updates for Firefox, Safari, IE etc. and sometimes they just can't seem to catch up at all! Currently, I can only print Smart Source Coupons using Safari on my Mac - Firefox just won't cut it. Switching browsers is one way to print coupons if you just can't seem to get them to print on your current browser. I often switch back and forth from Google Chrome, Firefox and Safari in an attempt to reign triumphant over coupons.com. Sometimes it works, sometimes it doesn't. Right now I'm getting a Cups Filter error for Coupons.com and it's only something they can fix so no matter how many browsers I try, I can't win and I hate losing! 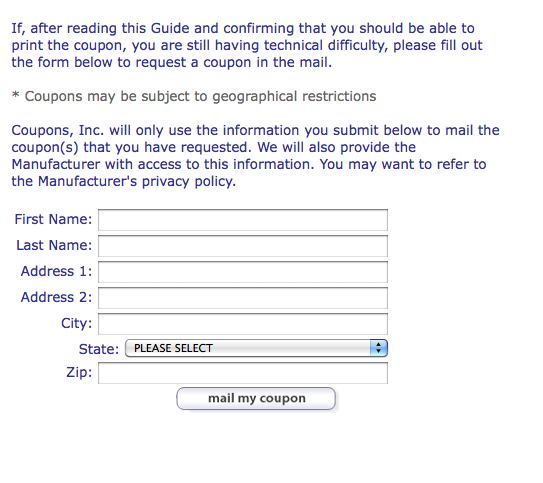 But there is a way to win some of these coupon printing battles and that is to get the coupons mailed to me! 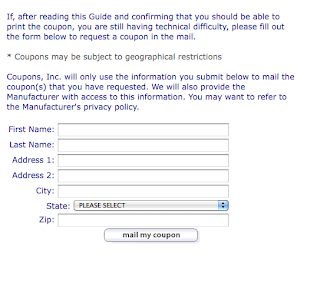 Yes that's right, you can get some printable coupons mailed to you! These coupons are called Bricks coupons (they have the word Bricks in the web address). If you have struggled with printing coupons or have never been able to print them successfully, keep an eye out for bricks coupons and you can still save money! If you click on a "bricks" coupon and it just won't print, look down in the bottom right hand corner of the screen and you'll see a help button (most coupons have this option, but not all). Click the help button and fill out the form to have to coupon mailed to you! Make sure to use your back arrow to request a second copy! You can get 2 coupons mailed to you, just like some folks can print two copies of the coupon! You might not be able to get the coupons right away, but at least you can still get them! The CIC (Coupon Information Corporation) is a not-for-profit association of consumer product manufacturers dedicated to fighting coupon misredemption and fraud. They have just released a voluntary best coupon practice policy for all retailers with whom they work. As a customer friendly retailer, we encourage the use of coupons by our guests in our retail stores, in accordance with the following guidelines. Use of 40 or more coupons per transaction, a transaction involving more than $100 in coupons, or coupons totaling more than 20% of the gross sales price will require approval by a Manager. We check for the CIC Hologram when a free product coupon with no separate purchase requirements is presented (i.e., Buy One, Get One Free coupons generally don’t feature the CIC Hologram). BOGO coupons cannot be “chained” (i.e., two BOGO coupons cannot be used to on two items to get both for free). Unless stated otherwise on the coupon, the use of one BOGO coupon requires that two of the valid items are presented at checkout; one item will be charged to the consumer and the second item will be discounted by its full retail price. In a BOGO transaction, a second cents-off coupon cannot be counted towards the purchase price of the first (buy one) product. We accept valid Internet/Print-at-Home coupons. Note: There are currently no valid Internet Print-at- Home coupons that provide a 100% discount or free product. We do not accept Internet Print-at-Home coupons valued in excess of 75% of the sale price of the product. We monitor the CIC web site for announcements of new counterfeit coupons. We will work with law enforcement authorities to prosecute individuals using counterfeit coupons. If a consumer returns a product purchased with a coupon, the value of the coupon will be retained by store so the funds can be refunded to the manufacturer. The coupon will not be returned to the consumer. The cash refund to the consumer will be the consumer’s out-of-pocket cost, taking the coupon into account. #1. We do not accept Internet Print-at-Home coupons valued in excess of 75% of the sale price of the product. I have never heard this before in my life. If a newspaper mfr. cpn can make a product free then why can't a printable coupon make a product free? #2. The total value of the coupons may not exceed the value of the transaction. I take this to mean no overage. While I am more than happy to simply get a product for free, it has always been my understanding that the retailers will always get the full face value of the coupon back regardless of the purchase price. Therefore I would imagine that the overage should be due a customer. I plan on contacting the CIC for a response to these two points and I'll let you know what I hear back. What are your thoughts about these new policies? Of course these are voluntary practices so whether you choose to support them or not is up to you at this point. In saying that, I believe many retailers will also move to support these policies as well. Now that I'm Girl's Camp director I need to come up with a craft for each day I'm in charge of 32 girls this July. Trying to come up with something fun to do, but also working in a tight budget, was a great challenge and I've had fun imaging what we can do "on the cheap". My first thought was painting fingernails, as I learned how to skillfully paint images and designs using the addition of acrylic paint not long ago. But alas, I've done this one already. Next step - bling it up! 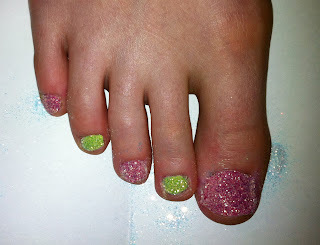 I love Glitter Toes, but not the outrageous cost or the inability to easily remove them once the gel has set. I googled around trying to find an inexpensive way to make my own glitter toes and found some less expensive alternatives. I found a few ideas I liked, but they were still way too expensive for 32 girls. 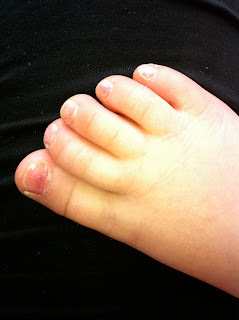 Then I found NoBiggie's DIY Glitter toes and had an idea! What if instead of buying all kinds of colored glitter I could just use my 1/2 pound bag of Ultra Fine Prisma Glitter that I bought about 10 years ago (and I'm sure I used a 50% off coupon to buy it!) and used the nail polish to create the color instead? Guess what? It works!!! No need to buy 10 different colors of glitter, just use"transparent" glitter and paint your toes with the nail color of your choosing for ultra cheap, ultra easy Glitter Toes! Step #1: Clean and File Toes. Place foot on open cardstock with crease in the middle to easily collect and save any excess glitter. Step #3: Gently remove excess glitter around the toes (tap toes to remove excess from toenail) with brush and cover with a clear top coat. Wait 5 minutes and apply another clear coat. I did one foot with Sally Hansen and one foot with Covergirl. Both worked out great, but now my daughter has multi colored feet! On a side note - make sure that if you have little children - oh, let's say a 2 year old, that you remember to put all the polish away when you're done or they just might find it and paint their own toes while you're not looking! But hey, on a good note, he didn't get any on the floor and painted all 10 toes like a pro! He didn't even go out of the lines - pretty good I think!